Giving up coffee creamer wasn’t that hard for me. We just started transitioning to real food and I kinda freaked out thinking about the plastic I was pouring in my cup each morning. The immediate fix was substituting with half & half and Splenda. It took a few days of adjusting, but my morning coffee experience wasn’t ruined or anything. About a year later, I stopped using Splenda altogether and switched to liquid vanilla stevia to go alongside my half & half. Then one day, we ran out of half & half and I used milk instead. Which oddly enough, I liked better. When 2014 rolled around, I made a tiny goal to stop adding sweetener altogether in my coffee. I’ve been drinking it with just whole milk ever since! I’ve known for awhile that there are “better” coffee creamers on the market. The ingredients on those containers read milk, heavy cream, sugar and natural flavors. I’m not too concerned about the first three. Ideally, there wouldn’t be any sugar at all since it took me several years to wean myself off, but you can’t win every battle. Seeing “natural flavors” listed does concern me since that phrase really covers a wide array of possible flavors derived in a variety of ways (read the definition of “natural flavors” here). And just because it’s natural doesn’t mean you’re actually getting the food as found unprocessed in nature. That list of ingredients I just shared was for the vanilla flavor, yet you’ll see that vanilla isn’t listed anywhere on the ingredients. So basically I turned a blind eye and ignored those creamers. Until this past Christmas when my mother-in-law brought out the all-natural vanilla-flavored coffee creamer. I’m a sucker for vanilla flavored anything, and the mere fact that it was Christmas AND we were visiting family out of town AND we had just moved across the country AND I was pretty much as stressed as I had ever been in my whole life means that I used the coffee creamer. Joyfully. Blissfully. Deliciously. Every. Single. Day. And I don’t regret it one bit. I don’t have the desire to start putting coffee creamer in my coffee every morning, but it is nice to have now and then (like holidays and gatherings and when I go on a cranberry orange scone binge), and it sure would be nice to have a real food coffee creamer that doesn’t contain sugar or natural flavors yet DID actually contain some flavor derived from real food. That’s where Homemade Vanilla Bean Coffee Creamer comes into play my friends. You’ll thank me forever and ever, I promise. Just like the processed stuff (and even the “all natural” stuff), my homemade recipe starts with whole milk and heavy cream. The ratio I have below is just how I like it – thick, rich and decadent. A liquid celebration of the morning, poured into my coffee mug. If you want a thinner creamer, use less heavy cream and more whole milk. Feel free to adjust the ratio until it’s just right for you. My recipe also calls for vanilla extract, which is something else you can adjust to your liking. Do be careful when adding more. There’s a fine line between more vanilla and that liquor aftertaste. Trust me on that one. I chose to sweeten the creamer with maple syrup instead of honey because I think the flavor of maple syrup simply tastes better in this recipe. I like honey, but it doesn’t taste good with milk in my opinion. I kept it at just 1 tablespoon because I’ve been drinking my coffee sweetener-free for so long, but you can add more if you’d like, 1/2 tablespoon at a time. Finally, the secret to this amazing recipe is vanilla bean powder. Before you toss your hands up in the air and wave your finger at me to say you have no idea what vanilla bean powder is, that you can’t afford vanilla beans in the first place and why in the world would I suggest such a thing on a frugal food blog – let me remind you that while I personally ADORE vanilla bean powder, it’s entirely optional. I inherited vanilla bean powder from my mother-in-law, who was given some by a neighbor. I think she got it at Williams Sonoma. You can buy it off Amazon here and while the price is a bit hefty, that bag will go A LONG way. My jar is 1.5 oz and it’s lasted me nearly a year. It would likely last me longer if I hadn’t made so many scones over the holidays. Even still, if vanilla bean powder is too much of a splurge for you, skip it for now. 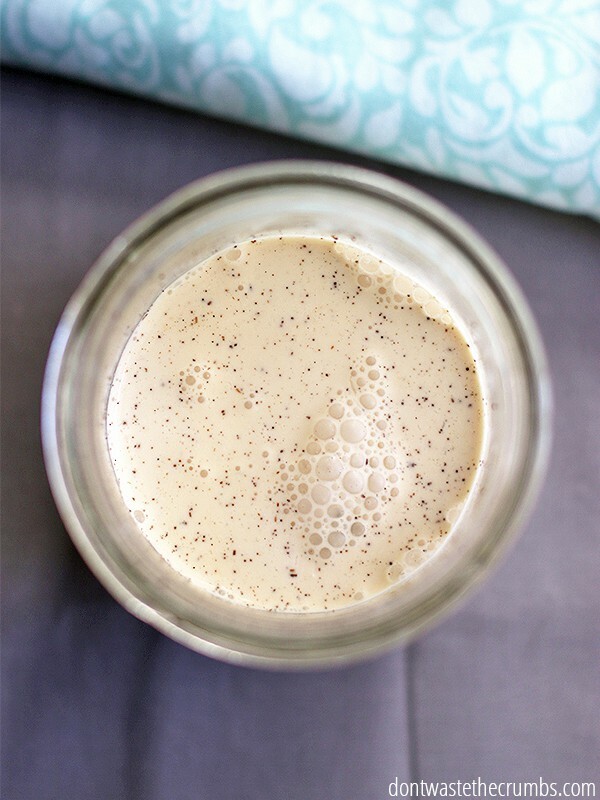 I’ll have a tutorial for you showing you how to make it yourself this Spring – just as soon as our moving truck is delivered and I can get to my vanilla beans! 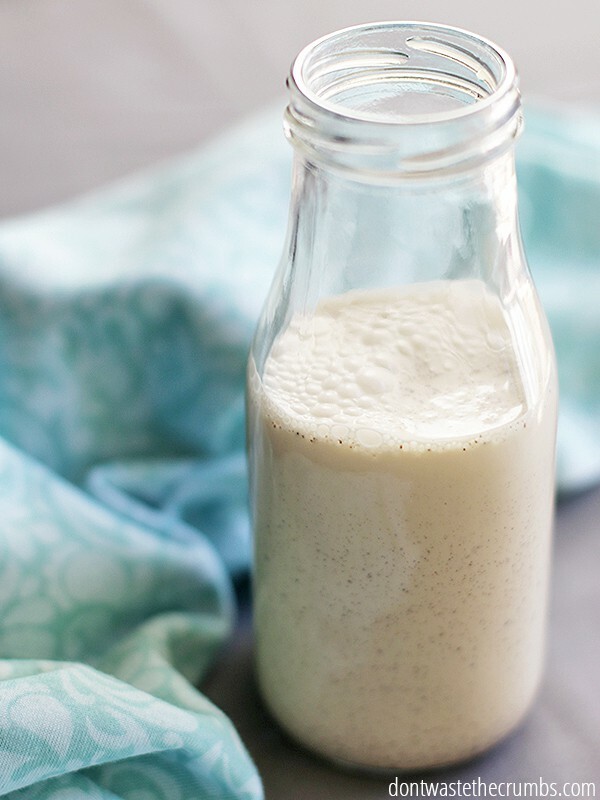 Combine milk, syrup, vanilla extract and vanilla bean powder in a jar and shake like crazy. Store in the fridge for up to 1 week. Swirl jar gently before pouring into your favorite beverage - enjoy! Do NOT add heavy cream at the beginning and shake like crazy, otherwise you'll end up with a lot of foam and something that resembles whipped cream. Add it at the end, and always stir gently or swirl carefully before serving. 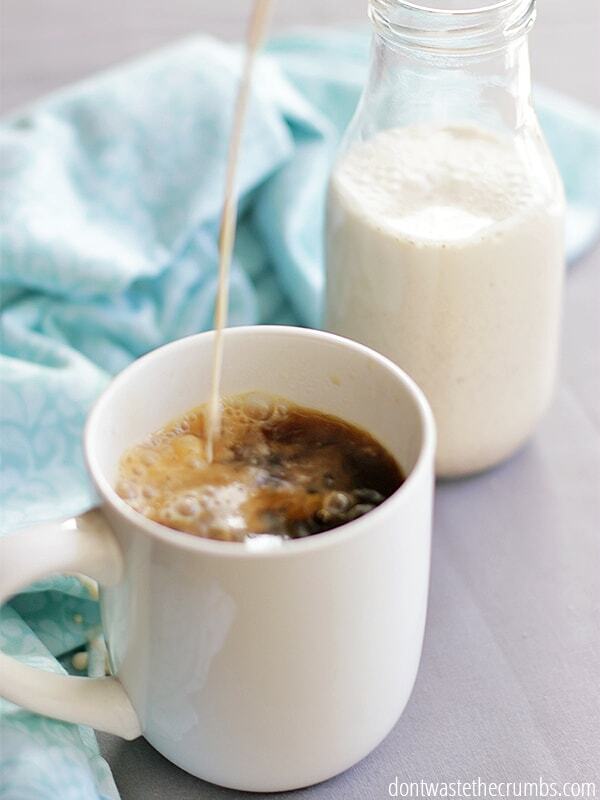 Total cost for Homemade Vanilla Bean Coffee Creamer is $1.64 for about 1 cup. Compare to the store-bought all-natural variety for $1.14 per cup. Comparing prices, making it yourself is just a bit more expensive. BUT, here’s where I firmly believe that if you are an avid coffee creamer drinker, making it yourself is the way to go. Especially if you’re drinking the stuff with carageenan and hydrogenated oils. Yuck! To help offset the price of homemade, buy all your ingredients in bulk. I’ve seen heavy cream at Costco for as little as $5 for a half gallon and up to $9 for the same size. The price I used above is somewhere between the two. Of course, you can skip the vanilla bean powder too and if you combine that with a sale on heavy cream, you’ll get the cost down to $1.08 per cup. Do you drink coffee creamer? What’s your favorite flavor? This sounds delightful. I do use creamer (and have been going back and forth trying to cut it out of my life – unsuccessfully so far). 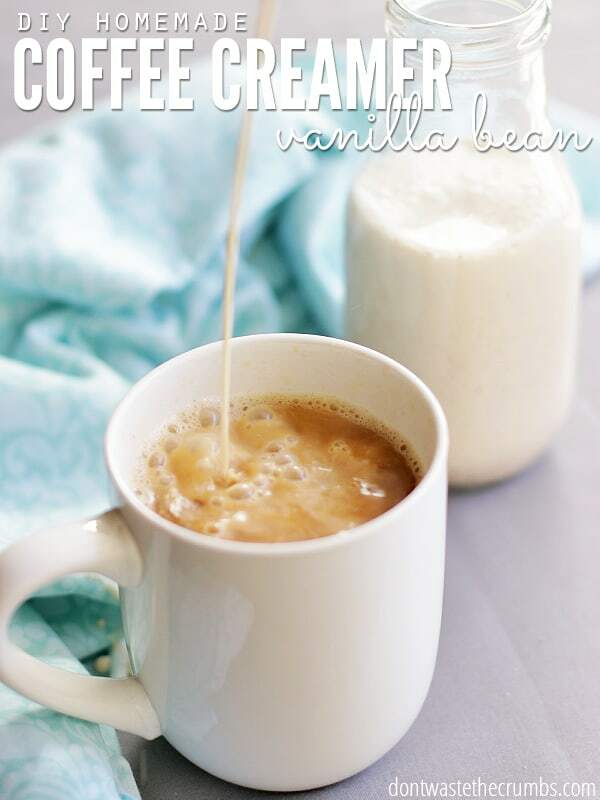 I usually just use the “original creamer” (because the flavored ones are extra sweet), but I love vanilla-anything and definitely need to try this. Thanks so much for sharing! Does the vanilla bean powder add a lot of vanilla flavor? I made this without it and I’m not really getting a strong enough vanilla flavor but didn’t want to add too much more vanilla extract. Trying to decide if the powder is worth purchasing? Thanks! I think it does Liv – I can really taste the vanilla flavor on day 2. I made it the other day with 2 Tbsp of vanilla instead of 1, and omitted the powder and thought that it needed more syrup to offset the extract. Do you have any vanilla beans on hand by chance? Do you think I can use vanilla bean paste instead of the powder? I keep my homemade vanilla extract in a dropper bottle. I put a few (10, I really like vanilla) drops in my cup before I pour coffee. Then ci add milk as desired. No need to make creamer. I am going to make this! Where do you purchase your vanilla beans? I have vanilla bean paste. Can I use that? You probably could Linda. Be sure to whisk really well so you don’t get clumps! By making it your self you can also avoid ultra pasteurization. I find ultra pasteurization changes the taste and texture just a bit and they don’t act as well in recipes. This is a personal opinion. You may have had better experiences. Thank you, you are holding my hand as I start this new venture. That looks amazing! I never use coffee creamer (too sweet! ), but I will be trying this. I have also never even heard of vanilla bean powder – I will definitely be getting some of that, too. I don’t know if you’ve tried it yet, but if not, I recommend cold-brew coffee. It is so smooth – I never feel the need to add milk/cream/creamer to it. I got the best info from this site: http://www.americastestkitchenfeed.com/do-it-yourself/2011/08/how-to-make-cold-brew-coffee/ – I usually brew a 2x concentrate because that is what fits best in my french press – and if I do get a wild desire to add some milk, I can do so without diluting the coffee flavor. This tastes excellent! I used a top quality extract and 100% vanilla powder (read ingredients of what you purchase because most are sugar with a little actual vanilla powder). The vanilla ingredients were really expensive but well worth it and the powder goes pretty far. I could not believe how good this tasted without a bunch of chemicals to mimic the real vanilla flavor. Add this to DIY iced coffee and you will never drink any other coffee and creamer combination. Thanks for the raving review Rick! Hi Tiffany – Just found your site as I was looking for a cheat to making Buttermilk as I never have any of the real stuff when I want to bake and you saved the day. I also found the Vanilla Bean Creamer you make & yayyyy! I stopped using margarine because of the hydrogenation process so finding a creamer cheat is a blessing as I can also take coffee thru IV 24/7 (lol). For the creamer do you use Heavy Cream or Light Cream and does it really matter? Thanks so much for all this info. I noticed our heavy cream has carrageenan too. I think the half and half does as well, but I’m not totally sure. Our ice cream used to have it, but I got my mother to switch to a different kind that doesn’t. It’s actually the better quality by the same brand. Everyone prefers it now. It’s a scary world out there. Everything seems to have strange additives or hidden sugars/trans fats/saturated fats. Or palm oil. That’s not good either. Could this be made dairy free with almond milk maybe? You can, but it definitely won’t be as thick. I’d suggest starting with 1/2 cup almond milk and adding canned coconut cream (the solids from a can of coconut milk) one tablespoon at a time until you get the desired consistency. The vanilla flavor should be fine! Planning to whip this up soon. I’m planning on modifying it a little. Using 1% milk, and half and half. Probably more half and half though. I don’t want it to be too thin. Out coffee creamer doesn’t seem to contain trans fats, (yay!) but the third ingredient is palm oil. (No!) Considering it’s a fat free creamer, I’m a bit scared. Thankfully, my dad agreed to try out different creamers. I hope we’ll both like this one. If we do, it’s be the winner.